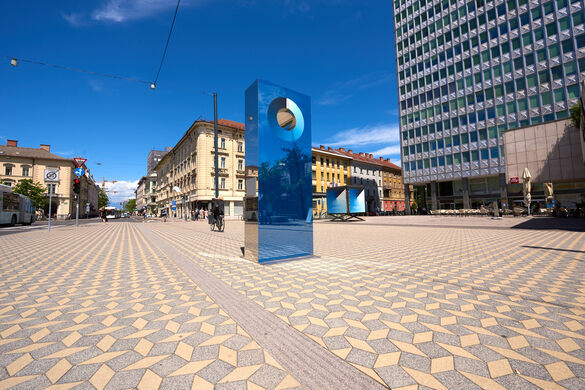 Cyanometers have been color-coding the sky since the late 18th century, but Martin Bricelj Baraga’s Cyanometer sculpture adds a modern twist. 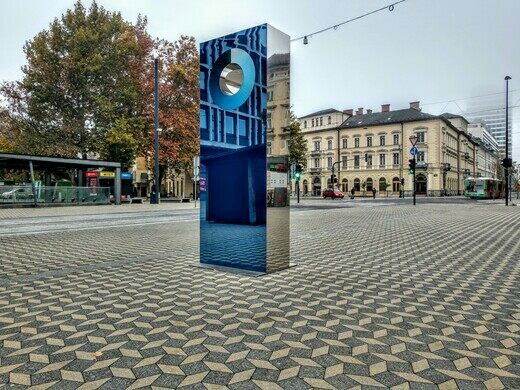 Located in the center of Ljubljana, Slovenia, the monolithic structure blends art and science, measuring the blueness of the sky and looking stunning doing so. Not only does Baraga’s cyanometer periodically capture images of the sky and measure them against the 53-shade color wheel toward the top of the structure, it uses the data to imitate it, changing color to blend in with the sky. Day and night, cloudy or bright, its reflective surface shines for passersby in the various shades it adopts. Like a traditional cyanometer, the sculpture, which is more than 10 feet tall, is also a scientific instrument. From the blueness of the sky it determines the air quality in the area, which is affected by the presence of moisture and particles in the atmosphere. 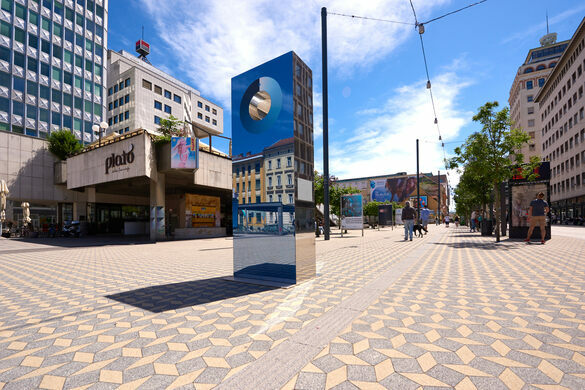 A nearby Environmental Agency of Slovenia measuring station assists the sculpture in collecting this data and determining its exact nature. 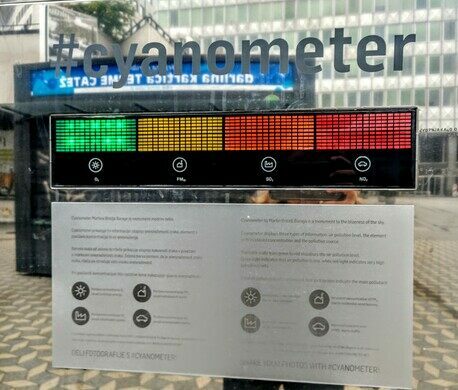 The cyanometer then sends the information to a website and displays it, along with the temperature, on its own surface, with air quality measured on a color scale that goes from red to green. Invented by Horace-Bénédict de Saussure in 1789, the original cyanometer was made with 53 squares of dyed paper, arranged in a circle from white to black by way of shades of blue. By holding the device up to the sky and studying the blueness under different circumstances, de Saussure established the criteria that Baraga’s cyanometer uses to measure the quality of the air today. 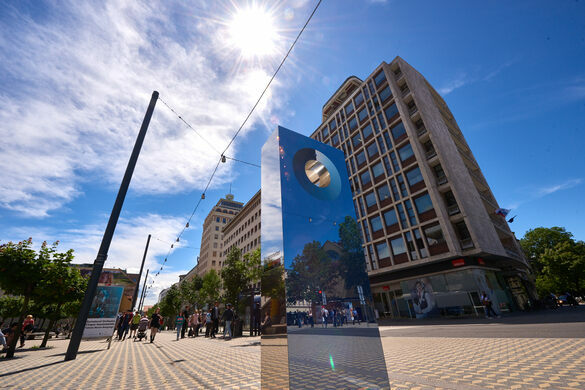 The cyanometer in Ljubljana was installed in the town’s pedestrian zone in 2016, and Baraga, an intermedia artist, plans to install similar devices in York, England, and Wroclaw, Poland, in 2017. It is part of Baraga’s “Nonuments” series, installations in public places based on futuristic and utopian ideas. 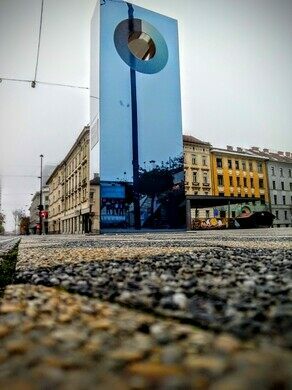 The sculpture is made of glass and stainless steel and powered by solar panels, which means not only does it power itself in the center of Ljubljana, but it could do the same anywhere in the world. 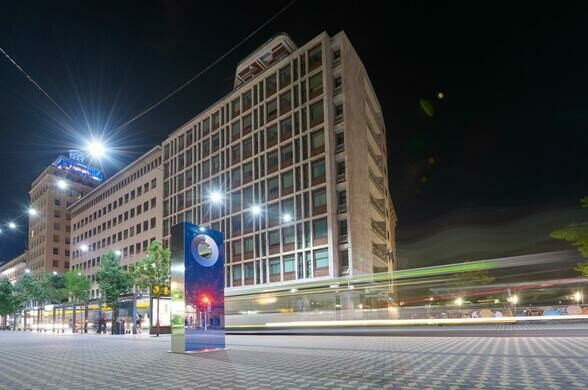 Slovenia’s capital city has been working toward becoming as green as possible for the past 10 years, and the installation of the cyanometer corresponded to Ljubljana being named the European Green Capital of 2016. This makes it perhaps the best place for such an installation, one that both judges how clean a city’s air is and literally reflects that cleanliness back at it. This 29-ton granite ball spins around at the slightest touch thanks to a scientific phenomenon.